Here we examine imaginative drawing abilities in children with Autism Spectrum Disorder (ASD) and learning disabilities (LD) under several conditions: spontaneous production, with use of a template, and combining two real entities to form an ‘unreal’ entity. Sixteen children in each group, matched on mental and chronological age, were asked to draw a number of ‘impossible’ pictures of humans and dogs. 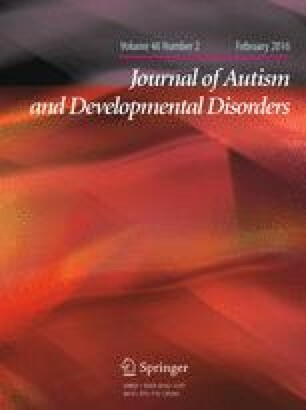 Children with ASD were impaired in spontaneous drawings and included fewer impossible features than children with LD, but there was no difference when a template was provided. An autism-specific deficit was revealed in the task involving combining entities. Results suggest that children with ASD do not have a general imaginative deficit; impairment is instead related to planning demands. The authors wish to thank the specialist school who kindly allowed the study to take place within their setting, and to the parents and children who participated in this research. MA participated in the design of the study, performed statistical analysis, interpreted data and drafted the manuscript; EC participated in the design of the study, collected data, contributed to statistical analysis and interpretation of the data. Based upon Scott and Baron-Cohen (1996), a child’s picture was scored as ‘impossible’ if body parts of the human or dog were misshapen, positioned in an incorrect place, incorrectly orientated, alien features were added or features usually present were omitted. A picture was defined as unsuccessful if none of the above ‘impossible’ features were detected and all features were correctly shaped, correctly positioned, correctly orientated, no alien features or elements were added, and if no elements that appeared on the ‘real’ drawing of the same creature were omitted. The proportion of ‘impossible’ features drawn for each picture was also calculated following Low et al. (2009). The number of ‘impossible’ features for a picture was calculated and then divided by the number of overall features. An overall feature for the human was counted if it represented either of the following: head, face, body, arms and hands, legs and feet, hair or ears. A pair of legs or arms counted as a single feature and any additional features that were added, such as a tail on a human, were included as an overall feature. A feature was included as an overall feature for the dog if it represented the head, ears, face, body, front legs, back legs or tail. A feature was deemed as ‘impossible’ if it met the criteria of Scott and Baron-Cohen (1996) described above. The modified scoring system of Leevers and Harris (1998) was used for consistency with the spontaneous condition. In order for a child’s picture to be scored as ‘impossible’, the head of both the human or dog were misshapen, incorrectly orientated or positioned, alien features/elements were added to either the head or face or to other body parts on the template, or elements usually present were omitted. Elements usually present in a given entity that were omitted from the ‘impossible’ version, only allowed a definition of ‘impossible’ if these features were present on the head/face in the ‘non-impossible’ picture of the same creature. A picture was defined as unsuccessful if no ‘impossible’ features were detected. The proportion of ‘impossible’ features drawn was also calculated as per the spontaneous condition. Children’s drawings were scored as per Craiget al. (2001). A score of ‘pass’ was recorded if children met the criteria of indicating a single entity that fused together elements of the two primary representations (e.g. the train–car condition had to be drawn as one ‘vehicle’ including features of both a train and a car). Children failed the task if two separate real entities were drawn or the drawing depicted only one of the two real entities for example only representing the dog and consisting of no human features. The number of features drawn in each picture was also counted. Real pictures were scored for number of imaginative features as per the criteria used in the spontaneous condition in order to provide a baseline measure of whether children included impossible features in their real drawings. We also coded the number of features that changed between each child’s real picture of a human or dog and their spontaneous ‘impossible’ human or ‘impossible’ dog. The overall number of features drawn for each picture was also calculated to investigate whether children included a different number of features in their drawings dependent upon whether they were of real or ‘impossible’ entities. Jose, P. E. (2003). MedGraph-I: A programme to graphically depict mediation among three variables: The internet version, version 3.0. Victoria Univesity of Wellington, Wellington, New Zealand. Retrieved 17 July 2015 http://pavlov.psyc.vuw.ac.nz/paul-jose/medgraph/.